Sorry Marvel fans, but Life is NOT a Venom origin story in disguise. If you haven’t heard this rumour in the days leading up to Daniel Espinosa’s big-budget sci-fi horror, it’s basically a theory suggesting that the whole film is being purposefully mis-marketed as a straightforward Alien knock-off, and will be revealed to be a prequel film to the popular Spider-Man villain. The signs were all there, from the extra-terrestrial being a symbiote-like organism that attaches itself to people and devours them, to the film being distributed by Sony, who up until recently owned the full rights to the Spider-Man universe, so it wasn’t surprising that this theory caught on with a lot of people leading up to this film’s release, with many hoping that it would in fact be true, not unlike Split very recently with its own connections to Shyamalan’s Unbreakable. But nope: Life really is just a straightforward knock-off of Alien, with a little bit of Gravity thrown into the mix too. But as far as movie knock-offs go, it’s one of the slightly better ones, and exceptionally more well-made than many of the ones that also take its cue from Ridley Scott’s genre classic. The plot sees a group of astronauts on board the International Space Station picking up a floating satellite that has come directly from Mars. Once they examine its contents, they come across undeniable proof of alien life across the stars, in the form of a small rapidly-growing organism that is named “Calvin” by contest winners back on Earth. Of course, “Calvin” soon shows its more murderous side and begins to pick off the crew one by one, leading to a battle of wits and survival in zero-gravity as the remaining astronauts try to prevent it from reaching Earth. 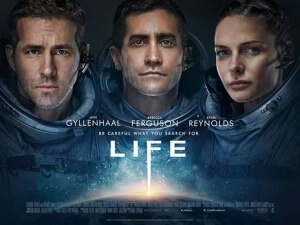 Life fits right along with many of the other sci-fi horror films made in the wake of Alien’s enormous and influential success, which doesn’t bode that well for its longevity with audiences (especially when there’s another film in the Alien franchise due to come out in under two months’ time as of this review), and it has just as much a desire to stick to certain plot beats as many of those other ones, from the claustrophobic feel of the space shuttle they’re on to the thin roster of characters that are mainly there to be killed and not much else. However, Espinosa and co-writers Rhett Reese and Paul Wernick go out of their way on several occasions to make sure that their film isn’t something that looks and feels like it’s come directly from the Syfy channel. Visually, it’s very well-crafted with some sharp, sinister cinematography, although parts of it do feel like they’re table scraps from the Gravity editing room, particularly an opening sequence done in one unbroken shot that is eerily similar to the opening of that film. The acting is mostly pretty solid all around, though that’s the minimum to be expected from big-name actors like Jake Gyllenhaal, Rebecca Ferguson and Ryan Reynolds, and they all do serviceable work despite spending the majority of their screen time floating about in mid-air. As for the alien itself, it’s got an inventive design and look to it that may not be as instantly recognisable as the HR Geiger designs in Alien, but for what kind of film this is it could have been executed a hell of a lot worse. In that paragraph alone, there was at least one reference to Alien or Gravity when talking about this film, and that’s kind of the problem; because the film is structured in ways that are incredibly similar to those kind of films, you really can’t help but think about them constantly when you’re watching it. Originality is not Life’s strongest suit, and again it’s a detriment to this film’s chances at longevity because it is so close in spirit to those more well-known – and honestly better – sci-fi films that it’s more than likely that this will fade into obscurity fairly quickly and will be easily forgotten by the masses. In addition, since it follows particular beats almost to a tee, you can tell exactly what’s going to happen next, which characters are about to be axed off etc… except for the very ending, which to be honest made all of the familiarity worth it. Obviously, there’ll be no spoilers here, but it’s the kind of ending where, since Ryan Reynolds, Reese and Wernick are all involved with this, you half expect Deadpool to pop out of the frame like Porky Pig and says “T-t-t-t-that’s all, folks!”, it’s that insane of a conclusion. Up until then, the film was just a standard, though above-average, sci-fi horror Alien knock-off, but then that ending comes around to go the extra distance, and suddenly it makes everything else seem like a bumpy, often familiar, road that had one hell of an eye-opening destination at the very end. I would say that if you’re just in the mood for a sci-fi film with an alien killing a whole bunch of people in an enclosed space, and for some reason your copy of Alien is missing, then Life is a fine time-waster which won’t be remembered many years from now (well, except maybe for that ending), but will satisfy your needs for outer space violence right there in the moment. Life doesn’t have much chance for longevity due to its strikingly close resemblance to previous sci-fi horror and suspense films like Alien and Gravity, but it is definitely one of the better made knock-offs of those type of movies, with solid acting and a strong eye for pleasant visuals, as well as a conclusion that goes the extra distance that other films like this normally wouldn’t go and makes all the previous mediocrity worth it in the end (literally).